Popularized in the 1920s and used heavily ever since, the bulldozer, commonly termed a dozer, is a clear offspring of the crawler tractor. Used in conjunction with other earthmoving vehicles, the bulldozer is a powerful and necessary tool utilized in almost every construction site in the world. Primarily manufactured in the United States by Caterpillar, John Deere, and Case Tractor Company, the bulldozer provides for many industrial applications such as construction, waste management, and farming. Bulldozers and crawlers, characterized for their immense blade and versatile track, are comprised of many structural, hydraulic, and engine assemblies. The core body of the bulldozer, consisting of the mainframe and undercarriage, is primarily fabricated from low carbon structural steel plates and a giant casting. The cab contains many glass, rubber, and plastic components which enhance the ergonomic feel of the machine. Supplying the power for the dozer and its various systems, the engine contains many high strength steel parts, which endure high operating temperatures. The other necessary components, the blade, power train, and various systems components, are formed from structural and high carbon steel. The track, which is fashioned from many standard grade steel links, adds to the already tremendous weight of this mostly steel machine. Once the dozer is filled with fuel, hydraulic fluid, coolant, oil, and other types of fluids, its weight increases by several hundred pounds. Decorative trim, decals, and paint complete the dozer's aesthetics and add distinctive appeal. Two distinct features characterize the bulldozer, the long, vertical steel blade in the front of the vehicle and the rotating twin tracks, which facilitate the bulldozer movement. The blade, which can weigh up to 16,000 lb (7,264 kg), is useful for pushing material from one spot to another. Perpendicular to the ground, the curved blade is attached to the frame by a long lever arm that can tilt and move up and down under hydraulic power. The familiar flexible track of a bulldozer is widely utilized in industrial machinery equipment and military tanks. In fact, some farming tractors are considered to be cousins to the bulldozer, since they also utilize the flexible track instead of standard wheels. Steel links, sometimes more than 2 ft (61 cm) in length, are connected with lubricated pins to provide for fluid motion and stability. Moreover, many bulldozers have incorporated an elevated sprocket design which suspends the power train, and thereby, improves its reactivity to the terrain. The diesel engine of the bulldozer can generate anywhere from 50-700 horsepower, so rough terrain and steep slopes are not a problem for this machine. Mounted above the flexible track, the operator cabin contains the complex hydraulic mechanisms, which power the blade in a limited vertical range. The cabin design has seen many improvements in operator comfort and ergonomics and has provided for many improved automotive features, such as air conditioning, AM/FM radio, automatic seat adjustments, electronic controls, and systems-monitoring equipment. In these areas of dozer design, the engineering and research that precedes the manufacturing mimic the automotive industry in many ways. The power train includes the transmission, differential, and gears that rotate the track. Coupled to the engine crankshaft, the power train will transmit power from the engine to the elevated sprocket gear. Many new bulldozers have independent steering, which allows each sprocket to rotate at full power even while one is rotating slower as the dozer is in a turn. Other innovations in recent years include differential steering, hydraulic power, and planetary gear transmissions. The bulldozer, a seemingly endless network of bulky steel components, complex systems, and intricate assemblies, begins its manufacturing process on an assembly line. Prior to final assembly, much machining, fabrication, and sub-assembly must take place. Manufacturing begins with engineering prints and drawings taken from a computer-aided drafting (CAD) program that outlines the method of construction for each component part. Some of these programs can be used to set up machines for which most of the manufacturing will take place, that is, in fabrication cells, large machining centers, and sub-assembly lines. This is called computer-aided manufacturing (CAM) and is used to produce the components and assemblies that join together on the main line. Some of these components will then undergo heat treating, annealing, or painting after their respective fabrication cell, sub-assembly line, or machining center step. An overhead conveyor system will then transport the pieces through the rough paint or powder coating operation and lift them to the main assembly line, where they arrive in time to be assembled. These pieces may also be transported by lift truck, hand cart, or floor conveyor to arrive at the staging area before they are assembled to the bulldozer. 1 The mainframe core, which forms the rigid inner body, is cut from steel plate and structural shaped, so that it easily resists high impact shock loads and torsional forces normally incurred by the dozer. The main structural skeleton, formed through the welding of steel plates to machined casting, is comprised of two boxed-in rail sections connected to the main casing. The fabrication is normally performed in a fabrication cell, where the burned plate arrives ready to be mounted into fixtures and manually or robotically welded to the stationary central casting. Far too massive to be lifted by hand, the frames are then transported by overhead crane to different stations, where steel mounting blocks and trunions, or cross members, are welded on as a support for the other components of the bulldozer. Once completed, the frame is rotary sanded on all plated surfaces and sent to the paint booth and the main assembly line. 2 At the assembly line, the independently manufactured diesel engine and transmission join the mainframe. The engine is usually purchased completely assembled as it is a complex system with machined components that can be used in many different vehicular applications. In fact, the engine (which has been subjected to various performance tests) is certified to operate on arrival. The engine mounts in the front of the bulldozer; however, it is connected to the transmission, which sits in the back. The two are connected by a long shaft and supported by couplings and bearings. The transmission is then connected to a series of gears and differentials to comprise the rest of the power train. By mounting on pads previously welded to the frame, the engine/transmission assembly can be bolted directly to the base on the main assembly line. 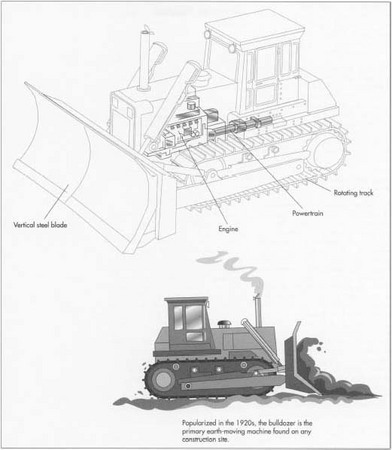 Two distinct features characterize the bulldozer, the long, vertical steel blade in the front of the vehicle and the rotating twin tracks, which facilitate the bulldozer movement. The blade, which can weigh up to 16,000 lb (7,264 kg), is useful for pushing material from one spot to another. ready to be fastened directly to the engine or base. These include hydraulic lines composed of tubes, hoses, and fittings pre-assembled and mounted on the engine or frame and connected to pumps, valves, tanks, and cylinders, each of which can be brought to the main assembly line as a finished component. Fuel, exhaust, hydraulic, and coolant lines also arrive ready for assembly and mate to other finished components. Many of these components and sub-assemblies must be inspected and approved for dimensional compliance at an incoming inspection station prior to assembly. As the entire assembly of the frame, engine, transmission, and line groups move along the main production line, larger assemblies and components are brought in by overhead cranes, overhead conveyors, automatic guided vehicles (AGV), or lift trucks. These components include the cab, larger hydraulic cylinders, undercarriage components, and the front blade. 4 The cab, which can also be purchased as a finished assembly, is usually manufactured at a different facility and shipped for assembly. Usually complete in its array of electronics and controls, the cab will be mounted on steel blocks or pads located on the dozer frame. After mounting, connections will be made to the various controls, and power can supplied to the fully functioning cab. 5 Concurrent with the engine/transmission mounting, the undercarriage, composed of tubular roller frames, drive sprockets, and bogey independent suspension rollers, will be mounted on the frame and assembled to the drive train. The axle assembly will turn the outer sprockets that rotate the track, allowing the vehicle to maneuver. The sprockets, typically 2 ft (61 cm) in diameter, will fit into the track with case hardened teeth, which move the track as they rotate. In many manufacturing operations, the undercarriage can be machined, assembled, and painted in the same facility as the main assembly line, but various smaller components like bearings and lubrication bushings need to be outsourced to other facilities or outside contractors. The track, which is often pre-assembled from machined steel links, can be fitted around the drive sprockets, rollers, and front/back guide gears only after the engine/transmission and undercarriage components are in place. The exhaust stack, attached directly to the engine, is supported by brackets and flanges at its base. 6 After the cab controls are connected to the engine and hydraulic systems, prefabricated cowlings or body panels are mounted directly on the base frame to cover the engine, transmission, radiator, and fluid lines. The body panels are designed to fold back, making the inside of the dozer easily accessible for regular maintenance. They are assembled into hinges already fastened to structural supports. Tooling and storage compartments may also be built into the dozer once the lines have all been connected. Deck plates lie around the cabin and are welded to support brackets. 7 The front blade is attached to hydraulic cylinders, which can position the blade at different angles of tilt. The cylinders, each comprised of a hardened steel piston inside a honed cylinder, are attached at one end to engine casing in the front of the bulldozer to move the blade vertically. Initially in the assembly process, the cylinders are left unattached at the one end until the roll formed steel blade is assembled, and then hydraulic lines can be fitted and tightened. The lower end of the blade is attached at two joints with large steel pins which rotate and tilt the blade with two more cylinders. Arms extending from the undercarriage are attached to the blade and then are assembled along with the other undercarriage components. 8 Once the dozer has been outfitted with its primary components, more hoses, electrical lines, and fluid lines are attached at fitted connections. Items such as the batteries, which are connected to the starter on the engine, lie underneath a cowling in a compartment located near the engine. Lights, one of the last items installed on the dozer, will be placed in a number of different areas and connected to their power source. In addition, hand or guard rails and foot pegs are bolted on the frame which complete main line assembly. 9 At Caterpillar's Track-Type Tractor (TTT) division located in Peoria, Illinois, Caterpillar bulldozers and crawlers use the same paint and final prep lines as many other tracked vehicles. Applied manually with spray guns, the final paint booth will deliver paint to any area not blocked off with paper or plastic wrapping. The paint dries quickly and the bulldozer will move to the next station where decals and trim are applied by hand templates. 10 Various fluids are added, and the vehicle is then sent to a testing station where the operation of all systems is mechanically verified and recorded. The vehicle is transported from the manufacturing site to a staging area for customization and shipping. The completed bulldozer is shipped on a flat bed trailer and is ready for field operation upon arrival. Waste produced by the manufacturing operations may include machining coolants, oils, parts-cleaning detergents, paint, and diesel fuel. The United States Environmental Protection Agency (EPA) places strict regulations on manufacturers to mandate that these potentially harmful liquids are disposed of in a proper manner. Companies contract a waste removal firm to recycle most of the liquid waste. Metal chips and shavings are recycled and sold to scrap dealers in an effort to reduce waste. Bulldozers consistently undergo component design modernization efforts, and innovations appear inevitable. Improvements in cab comfort and diesel engine efficiency will probably be the driving force for many of these changes, while design and operational changes will be limited to individual components. In spite of the fact these enhancements in both the manufacturing process and streamlining of material flow will probably not change the face of bulldozers, costs may improve. Therefore, as a useful member of any earth-moving team, the bulldozer will continue to serve a unique purpose in building construction, waste management, and many industries. D7R Track-Type Tractor Specifications. Caterpillar, 1996. D9R Track-Type Tractor Specifications. Caterpillar, 1995. DllR Track-Type Tractor Specifications. Caterpillar, 1996.